This statin denialism thing is not science. This is why Dr. Kendrick and his associates are confined to posting blog posts about it. It is rarely published in scientific peer reviewed papers. Ivor Cummins for example has no scientific papers! Where are all the 2019 scientific peer reviewed papers on it? Wait … there are 0. Medical journals do not publish this statin denialism. Statins have saved my life. This is nonsense what people here are saying that they do not work. Simon Derricut (life long atheist and skeptic from USA). Trolls lie, it’s that simple. They say whatever they think will outrage their targets. It works sometimes. The target will register an account on RationalWiki and counterattack, and will be quickly blocked and treated as if banned. If someone else tries to point out the problems with the RationalWiki article, they will be treated as sock puppets of the target, and it’s not uncommon for Darryl to create attack socks that are so identified, and this happens especially when the real person, their target, actually shows up. Oliver, Darryl’s brother, also runs this scam. On Wikipedia, someone who is “fringe,” meaning holding ideas that are in a minority (“fringe” does not mean “crazy’), who shows up because they can clearly see how outragesously non-neutral Wikipedia articles can be, typically has no clue about how Wikipedia actually works and so is immediately recognizable as an outsider, and easily marginalized, blocked, or even banned, as “SPAs” — single-purpose accounts, or “POV-pushers,” i.e, people pushing a point of view, attempting to make the project violate neutrality policy, whereas skeptical editors who do that are protected. Not completely, when they become entirely too outrageous, they may also be sanctioned, but the faction has developed ways to defang the sanctions. It’s a long-term scandal, well-known among Wikipedia critics. RationalWiki makes no pretense of neutrality. The Smith brothers, banned on Wikipedia, found a refuge there. And then occasionally create a new account on Wikipedia. If they wait roughly three months, Wikipedia dumps the server logs so checkusers cannot verify identity of an account beyond that, unless they kept copies of logs, which they sometimes do. And then they slip up and are caught anyway. All it takes is one edit, say from their parent’s home or visiting each other, and their cover is blown. But they simply abandon the account and go back to RationalWiki, where they have bragged that they have hundreds of accounts, and it’s quite plausible from what I’ve seen. I haven’t counted the ones I’ve identified. Mr Lomax you come across as obsessive. I would like to see less spam and unproven allegations about this Rationalwiki (not the topic of this blog). Can you please point to 12 peer-reviewed scientific papers that support statin denialism from 2018-2019 please? I found only 1 publication by Aseem Malhotra and it was shot down, easily. I warned the real Simon Derricutt (notice the spelling), January 17, 2019 at 8:36 am , of the impersonation. It has occurred before that a Smith impersonation was caught and the response was that if the name was spelled differently, it was not an impersonation. The comments above are classical trolling, comments designed to elicit angry or other emotional response, both from me and from Dr Kendrik and his blog readers. The first Darryl socking on Kendricks’ blog was comments designed to focus blame for Skeptic from Britain (Darryl) on someone else who had criticised SfB. That, again, is classic. This kind of blatant deception and lying is not a common trait of skeptics, but the problem with some skeptics is that they tolerate it, if the “message” of the troll is one that they like. They more or less believe that anyone involved with the fringe will also lie and deceive, so what is the problem with a skeptic doing it? Lies and deception form no part of genuine skepticism or the pursuit of science. not impersonation, simon dericut has one t on kendricks blog. abd lying again? Typical, again, Darryl claims I’m lying, but does not specify the lie. If asked, he normally ignores the question, because he knows is that in some contexts people will make assumptions that if two people are calling each other liars, both are crazy. Using anonymous accounts, he suffers no reputation hit by lying, and people who do not discriminate between anonymous accounts and real people miss the difference. In communities that support (and give administrative privileges to) anonymous accounts, they think nothing of this. This is, however, entirely different from practice in the sciences. Part of what makes the journal system work is that authors are responsible for what they write. Reviewers are allowed to be anonymous, and that can be iffy, but at least there are clear reasons for it. Editors are not anonymous, and are responsible for the decisions they make. So the real Simon, as I expected (he obviously follows this blog), showed up. In reply to no impersonation. “no impersonation” – have you run a search on “Simon Derricut”? That’s two times r and one t, as on Dr. Kendrick’s blog. You’ll find no other comments by that person, and where you find that spelling it’s someone else referring to me and getting my name wrong (Abd has done that as well). I’m “blessed” with a unique name in the world, as far as I’ve seen in various searches over the years. As such, that’s a sock trying (and failing) to impersonate me. Maybe he/she thought that Abd would treat the reply with more respect than an anonymous comment, but of course Abd can tell the difference in tone anyway. Used to be said that you know when you’re over the target because the flak gets heaviest. It seems to me that Abd must be pretty close to the target. It is getting a bit complicated to know who is commenting. Would that we could look people in the eye. Dr Kendrick is not an expert blog administrator (nor is he expected to be). It is not complicated, however, if it matters who people are and one takes steps. The software requires very comment given an email address, and generally comes with IP information (I don’t know about the blogs on WordPress.com. This can be checked on a service like whatismyipaddress.com. I’m hosting my own domain and can see raw access logs if I want to. A comment using a proxy server or, even more secretive, a Tor node, is hiding identity. Wikipedia, as an example, will block such IP on sight. I am not anonymous, I’ve been open on the internet since before the internet (i.e., on the WELL in the 1980s). The RationalWiki article is about me. And I’m easy to verify, just ask and provide a way for email contact. I believe I have sent Dr Kendrick email, and from the email headers he could verify it’s me. We could even talk on the phone. I would be honored to chat with him. Otherwise comments on blogs can blatantly impersonate people if it’s allowed. In the case of these trolls, anyone familiar with them can spot them immediately. Below I list 13 comments on this particular post I consider likely to be Darryl, or, less likely, his brother. “Steve James,” 2 comments, might be merely confused, but since he has never commented before, this is more likely Darryl. One might think that some skeptic could pick up on the conversation and post, but . . . how would they find this conversation? The RationalWiki articles are new, with low participation, and the comments(and Skeptic from Britain) have not been discussed there except in one obscure place. Most RationalWiki users are not particularly interested in the diet/statin issues, but Skeptic from Britain found a niche on Wikipedia and didn’t want to waste the experience, so he went back to RationalWiki, and they have a history of debunking quacks (real and alleged), so . . . .
What is the purpose of all this trolling? I think we are experiencing the second type. It is both, Mr Chris. There is more as well. From long experience, this troll knows that sometimes his comments will provoke responses that then cause harm to his targets. That is, in fact, classic trolling. I believe that vegans are behind these “debunking” articles, and they have made it clear the purpose it to use Google, they went behind silly names like “Vegan Warrior” or “Vegan Lady”. You are looking at teenagers or people in their young twenties with nothing better to do but become hooked by a “cause”. They think they are promoting “science” and “debunking” anti-science. When I saw this, I suspected this of being the troll. I checked and there is previous commenter by “Sarah.” If this were me, I’d check the email address and IP and see if it is the same person (Dr Kendrick should be able to see this information). There is nothing in the software to prevent people from stealing names. Why would I suspect “Sarah”? Because part of the agenda of the real troll is to stir up enmity between the vegan and low-carb communities. That is not, by any means, a proof, because Sarah’s suspicion is understandable. She is generally correct; but this particular troll is almost thirty, and may be or may have been paid, not by Big Pharma, but by a “skeptical” organization, or individuals supporting such. Rationalwiki is not a vegan website, they are just using it for their anti-low carb agenda. No doubt the person who created these articles will disappear soon or re-surface under a new name. The people behind this have caused a mass-load of confusion, impersonation, deception and manipulation to try and deflect. Tom Naughton has received fake emails from people claiming it is not vegans, suspicious. This is SOP for Darryl and his brother. I would suggest that Naughton contact me. There are many people who have been attacked by these trolls. People with widely different views, people with whom I might have little agreement other than detesting lies and deception and impersonation. If someone believes in my favorite ideas, and they use lies and deception to attack the “enemies,” they are the enemy. Big Pharma are not behind this, this is young adolescents with far too much free-time on their hands. Why else would every mainstream low-carb writer be added to this website, but no criticisms of vegans? This is probably a paid attack. If you look through the editing history of the person who has been creating these articles, he/she is online from 12 at night to around 10am in the morning. “Paid attack” and “young adolescents” are not particularly compatible. As I have mentioned, the age is about 29. Skeptic from Britain started on Wikipedia as an obviously experienced user, first edit was classic Darryl Smith interest in the paranormal and pseudoscience. By March, 2018, there were many signs this was Darryl, but . . . it looks like nobody was watching (Darryl is de facto banned as one of the Anglo Pyramidologist socks, the most notable Darryl sock being Goblin Face). Darryl may be a student of biology and that interest shows in some edits. While this is relatively routine, he would have avoided AfD previously because he knows it can attract attention, and if anyone experienced with AP socks looks his history, and is not allied with him, that account could be toast. Remarkably, it didn’t happen. However, November 22, 2018, he registered John66 on RationalWiki and, over the next few days, created a few articles on quacks. He edited Gary Null, adding standard skeptical material; he had previously edited this as Debunking spiritualism, a clear Darryl sock (who basically stopped editing RationalWiki when Skeptic from Britain started up on Wikipedia. The addition of a see also to Rome Viharo would be a red flag. So he was preparing to bail on Wikipedia, creating a backup on RationalWiki. He then went more intensely into alternative medicine and alleged quackery, highly controversial topics. He was not naive, he knew this would turn up the heat. Sooner or later someone might figure out who he was. With this edit, December 4, 2018, he advised Jytdog, a skeptical editor who had made a serious mistake and who had retired, that he should take a break and then come back with a new name. After all, it’s worked for him for many years. December 15, his user name was changed to MatthewManchester1994. He apparently claimed he had been outed, but if he had been outed, changing the name would only confuse matters a little, because this can be tracked. All his signatures as “Skeptic from Britain” will remain the same and then if one finds such a signature and looks at the page history, the current name will be there. If one has actually been outed, standard practice would be to ask for revision deletion of any outing and retire the account with no fuss. But he made a fuss. So he had a purpose here. He was lying. This was all smokescreen. He had made comments allegedly outing Skeptic from Britain or MatthewManchester1994 as another user with the initials in this comment (even after that whole trick had been exposed), giving the full name, an instagram account, and claiming he was a vegan activist. When this was a fairly fresh, I searched for “outing” of the real name. It was nowhere, and the only “outing” was fake, of that person, who had criticized SfB on Wikipedia, so he was using his retirement (probably planned since November) as an attack device. Nice, eh? This is the company that RationalWikians keep and facilitate. There is a problem with pseudoskeptical attack on cholesterol and harmful-fat skeptics, but these “skeptical activists” take it far beyond mere scientific controversy. Wikipedia user January 7, 2019 at 7:59 pm See anglo-pyramidologist/darryl-l-smith/skeptic-from-britain/wikipedia-user/ Notice the claim about financial support. 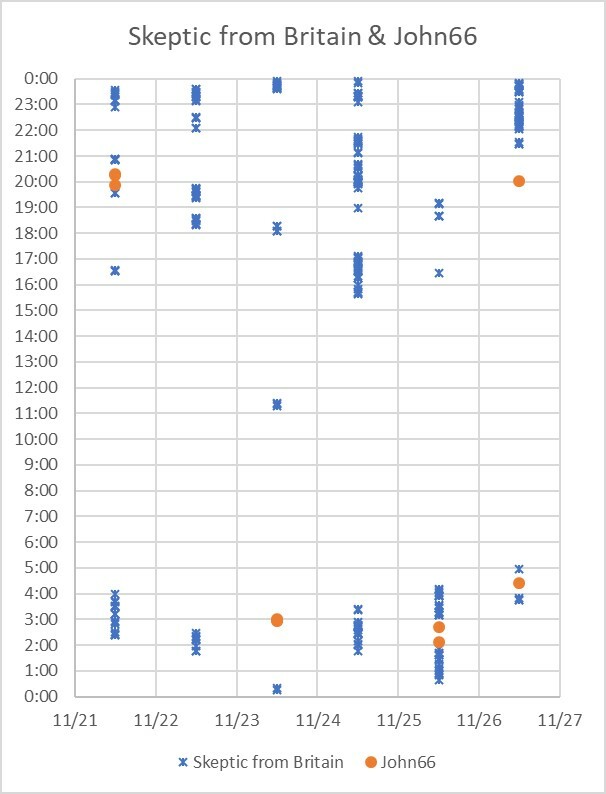 The chart shows edit date (horizontally) and edit time (vertically). 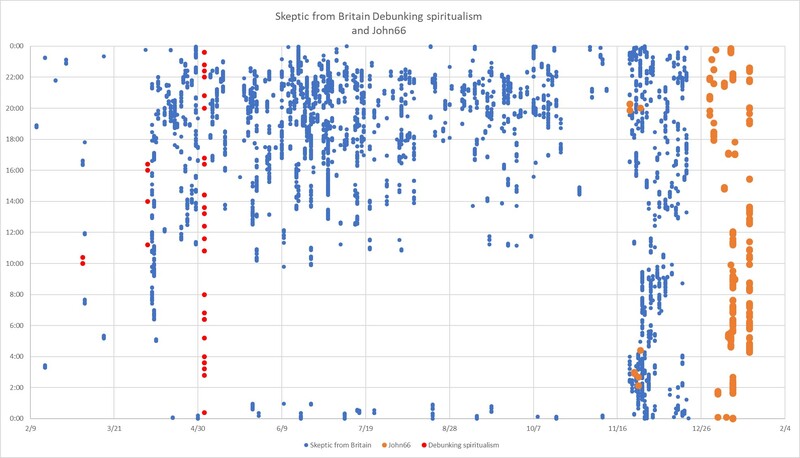 “Debunking spiritualism.” the red dots on the left, was the last identified Darryl L. Smith sock with substantial edits on Rational Wiki (there is at least one other account possible, under study). Those are the red dots on the left. The blue dots are Skeptic from Britain on Wikipedia. There is no overlap for these editors, they edited on different days. 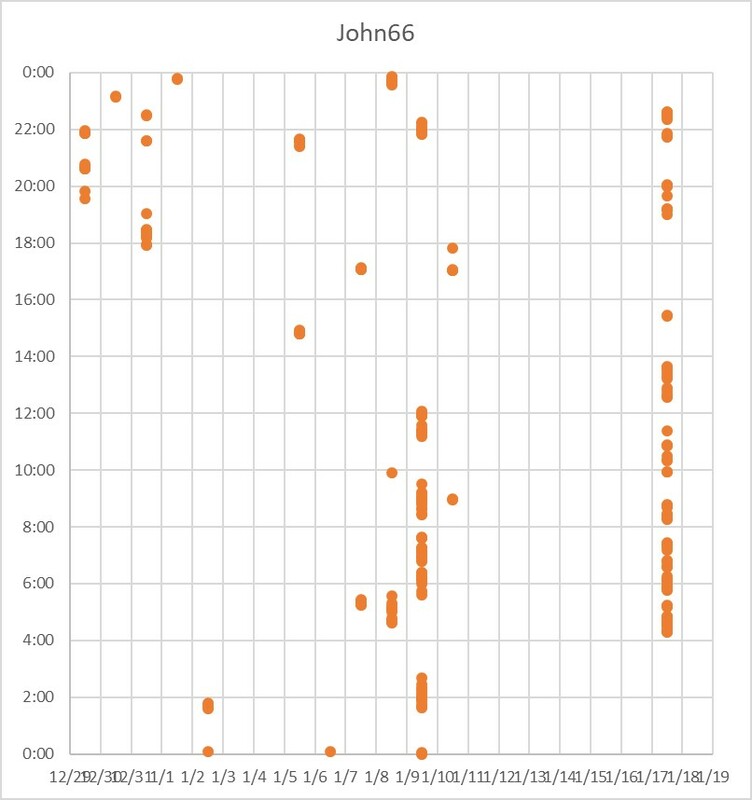 The orange dots on the right are John66 on RationalWiki, editing many of the same topics on RW as SfB did on Wikipedia. There is an area of overlap, where J66 started editing before SfB changed his name and then “vanished” on Wikipedia. This is a close-up of those edits. I have arranged the columns to make the day of edit clear. The date is on the right of each column, so the first edits shown were on 11/22. As can be seen, the timing is consistent with these being the same editor. Skeptic from Britain’s last edit was on 12/20. John66 did not edit again until 12/30. I intend to find as many blog comments as I can. A gap of 10 days, from past observation, generally indicates another active account. This is also a daily plot. Sorry about the captions. . . . As can be seen, his editing sessions do leave him time to sleep, every day. The heaviest day was today, but he has not edited since 22:51 (he made two more edits after I compiled the above). This is Universal Time, which is what RationalWiki and Wikipedia use. It is also his local time. There have been times when he has edited through the night. I used to do that, on occasion. He’s young, under thirty, it would not be difficult if he has work to do and miles to go before he sleeps. But when he has a long session, he then sleeps in. [. . .] While there is bad publicity the medium has not been convicted of fraud, and is working with lawyers on a benchmark defamation case against Rational Wiki and Banyan Retreat! 144.217.105.196, domain host Canada, I think I’ve seen Darryl use this, not sure. Any of this could be Darryl playing with himself. Or it could be Mannon or a friend of Mannon. Also blocked by John66. 31.14.72.47, proxy server, same organization as .25. No block because the article was semiprotected so an anon IP cannot edit it. That article was started by Darryl, as Debunking spiritualism, December 28, 2017. There had been previous legal threats. (making on-wiki threats is not how to handle a genuine legal issue, it is completely useless. That is one reason why Smith socks have made legal threats using impersonation socks pretending to be me. So what is all this about? Is there a real legal case? Maybe. But it will probably go nowhere. What I found was quite interesting. There are believers in psychic phenomena, who hate fakery and took action to uncover it. And see this. Critical thinking and dedication to truth among “believers.” Who knew? His main Wikipedia account. He has been banned on the [redacted] forum. I looked at this report, and the alleged sock was the subject of an SPI case reported by an Anglo Pyramidologist sock, I suspected it as soon as I saw the name. AP socks are not necessarily subtle. I looked at edits. I would not yet say “impossible,” but at this point it looks unlikely. There is more data I could collect but it’s probably a waste of time, which would be what the reporter would want, using an open proxy and a throwaway email account. People who do not trust me, I don’t trust. But I might look anyway. Increasingly I am not bothering to look at reports with no reason why the sock is suspected. Being banned somewhere is not relevant, unless banned for behavior that’s a red flag, and I know that impersonation socks are sometimes created to get them banned in order to smear the reputation of someone with that name or one similar. These are very nasty people, this is far from simple disagreement on skepticism or cold fusion or nutrition or any of those topics. That an AP sock tried to get this person blocked is actually a mild recommendation. I’m tempted to let him know. Abd – because of the European data-protection rules, on Disqus I no longer see IP addresses and email adresses when moderating R-G. Looks like you still can using WP, but that may change, and if so it will make the moderating task far harder. Disqus also has the option for the users to make all their previous comments hidden, and some people both do that and come in via TOR so there’s no context to decide on whether that is a real person, an impersonator, a bot or a troll. All you have is the comment itself. If it isn’t rude and makes sense, it gets passed. Dr. Kendrick’s comment about wishing to see people in the eye is apposite. Seeing some comment strings, where extreme rudeness is the norm (see Breitbart, for example, which I avoid for that reason) I wonder if those people would say that face-to-face. If so, they would probably have the bruises and bullet-holes to show for it. I don’t see any benefit in trying to shout down crackpots, and shouting down the fringe is a disservice since the people at the fringe may be right and deliver something that was thought to be impossible. Dr. Kendrick seems to be applying logic to the data he’s gathered and making a good case for there being a problem with the current medical consensus. That’s going to upset people who are making a good profit with the status quo, but I’d doubt if those companies would be unethical enough to employ astroturfers. I could be wrong here, of course, but there would be a high risk of being found out. As such, it seems the Smith brothers are doing this because they are evangelical in wanting to get their opinions to be generally accepted, and they obviously have the time on their hands to be able to do it. Maybe they have severe OCD or Asperger’s and are on a mission to save the world from wrongthink. I’ve had one commenter (multiple names) go on such a crusade against Mark Goldes, and I could recognise who it was (and I traced to his online attack-site) by quirks of his language. Some people like to stomp on whatever they think is wrong, and don’t recognise that they may be mistaken. Not that he was that far wrong about Mark IMHO, just wrong about maligning anyone who had worked with him as well, who were victims and not at fault except for too much trust. In order to stop the obsessive people screwing up Wikipedia and other public fora, I think you’d need to install systems that don’t allow anonymity. Like all computer systems, though, there will be ways around that and impersonations possible. Better systems will raise the bar somewhat, though, and reduce the problem until someone finds a way around the new system. It’s a game of whack-a-mole. Still, for Wikipedia the people running it are going to need to want to fix it, and maybe they don’t think it’s broke. The first task therefore seems to be to get them to acknowledge (publicly) that their system is broken. During my time in Failure Analysis, that was always a necessary first task before a fix was possible, and one fix took me two years to persuade the designers they’d cocked up and their “protection” circuit was causing a high-cost fault. Do you think you can persuade Jimmy Wales that there’s a problem that needs fixing? The data needed (and a bit more) is in raw logs. If the IP is eliminated in WP, I might decide to require account registration with email contact, which would be unfortunate. Trolls like the Smith brothers abuse privacy protection, but I also saw insanity around this on WMF wikis. A user was whacked by checkuser for being a vandal. The user denied the claim and asked for the checkuser information to be disclosed (he suspected his notebook had been accessed at a wiki meetup, or it could have been hacked). The steward refused, on privacy grounds. In fact, the policy allowed disclosure when a user waived their right to privacy. But that exception was not widely known. Basically, the guy was sanctioned because a checkuser claimed the user facing a ban was the vandal. So on that basis, who was being protected? At most, an anonymous vandal, who had, through blatant vandalism, given up the right to privacy. There were some stewards who were very bright. Some not. Some actually vicious. And then the election system is pretty much guaranteed to create functionaries like that. Naive, the founders were. As to Wales, I don’t know. Maybe, but does he care? My sense is that he realized he had a tiger by the tail and he had no idea how to turn it around. When he made sensible decisions, he had the “community” — really the squeaky wheels — yelling at him, and he doesn’t like being yelled at. The real problem: a community that does not take responsibility for watching the watchers. That problem is all over, it is not just Wikipedia, but wikis are particularly vulnerable. I found that solutions were very much not welcome, even as harmless experiments. And nobody protected the whistleblowers. Abd – in précis, looks like you’re saying the people who could change the rules don’t believe there’s a problem. While that remains true, the problem cannot be resolved. Same problem applies to blogs, and it depends on the moderators to catch the socks and bots. I’ve recently had a spate of real people putting up bot comments, and turns out the people have lapsed on the account for a long period (often a few years). Obviously there’s been some data stolen and passed to the botnet. Getting a useful conversation that’s open to all comers is going to become far more difficult in the future. Of course, you can limit the list to people you actually know personally, but that would tend to be an echo-chamber. Having free entry to the discussion risks bots, trolls, and various other undesirables, but is the way we also get ideas that we hadn’t considered before. From my (limited) viewpoint, the occasional troll has been worth it for the gains. For Wikipedia and the other wikis, we all know they can’t be trusted, so if they are happy with that reputation or don’t accept the characterisation then they won’t see any need to change.